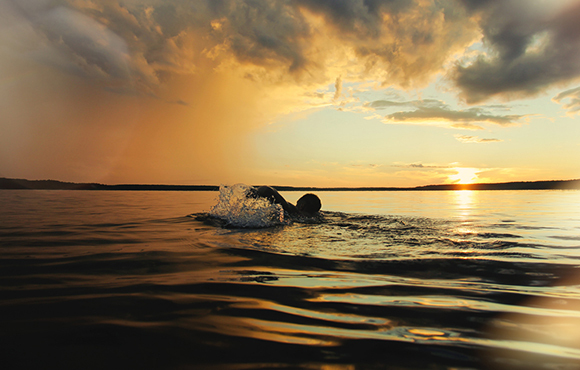 When it comes to open water swimming there are two types of people: those who are uneasy or become unnerved, and those that don't. The good news is everyone can move into that second group with smart strategies, techniques and practice. 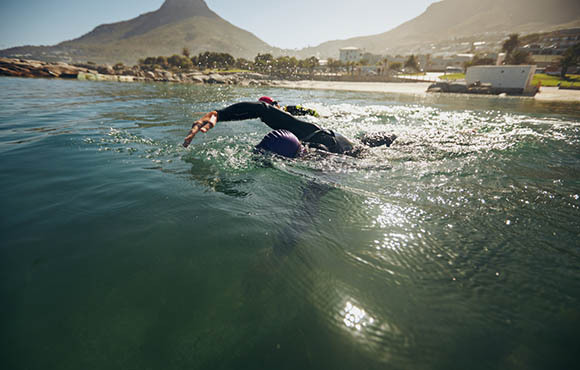 The better news is your open water swimming experience doesn't have to be just the absence of fear but it can be an enjoyable, confidence-boosting part of your training and racing. • "Wow. That looks far. Can I really swim that distance?" • "I'm so slow that's going to take forever!" • "It's choppy. I'm going to drown." Just because your mind thinks something doesn't mean you have to believe it. 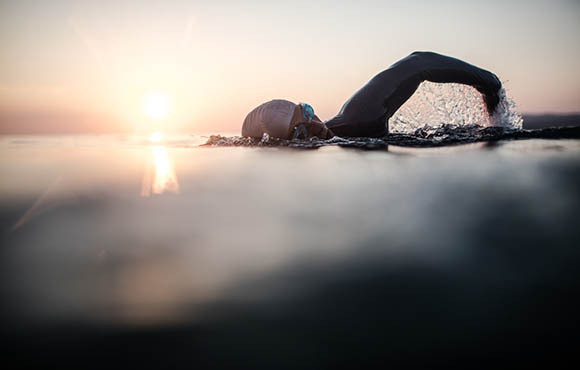 If you're psyched out at seeing the whole race course and far-off buoys from the shore, turn your thoughts to your training sessions of equal or greater distance. Yes, I can do that distance! I've done it before, I will do it today. Seeing the whole course always looks far, just as it would if you could see the whole bike or run courses fade into the horizon. Trust that if you've taken care of your fundamentals—good position, good catch, good kick, good breathing and good rhythm—there is no other option than to move forward and conquer the distance. 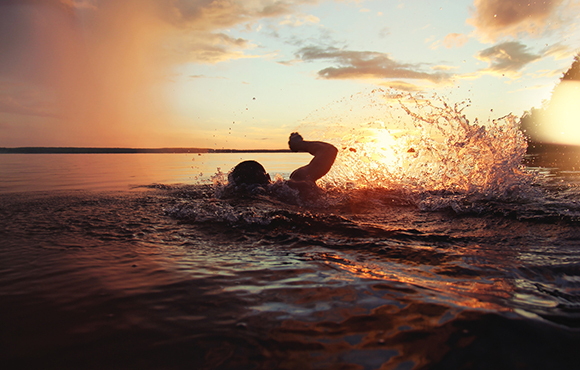 Even if the water is choppy your body will still have the advantage. It might take longer than normal but you will do it. If you're still feeling uneasy in the water, roll a little bit further than normal when you turn to breathe. Rather than just barely getting your mouth out of the water when you breathe, rotate your upper torso a few inches further so you face more of the sky. This can help relax your tensions. Practice in the pool to find your optimal "extra" rotation while maintaining a solid overall stroke. Forget what's needed to swim the whole course and instead focus your attention on the next 10 to 20 strokes, continually repeating that count. If that gets tedious, count up to 100 or more. This breaks down the distance into more comprehensible chunks and before you know it, you'll be rounding the final turning point and heading for dry land. 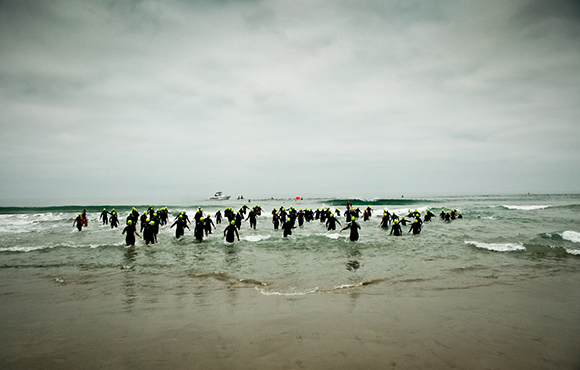 For some, fear of open water isn't just made up; something really happened. An actual event combined with intense emotional experience gets quickly embedded into your nervous system making any thoughts of swimming an anxious moment. But your past doesn't have to be your future, and you CAN make a successful return just as hundreds of other swimmers have done from traumatic experiences. Depending on how intense your experience was it's always best to ease your way back into it at your own pace. If necessary, find a trusted coach who can empathize with you. In a pool, start in the slow lane with flutter board and intervals of putting your face in the water. Get used to breathing again by blowing bubbles under water. Leave any thoughts of embarrassment at home and acknowledge the progress you're making even when it's not easy. If in the ocean, stand just after where the waves break close to the shore and just get used to the sensation of choppy water or swells coming at you or over your head. When you are comfortable with that, gradually evolve to treading water or being in a front crawl position while letting the water continue to roll over you. Don't worry about a full swim session to start, just focus on getting comfortable and confident with being in the water again. 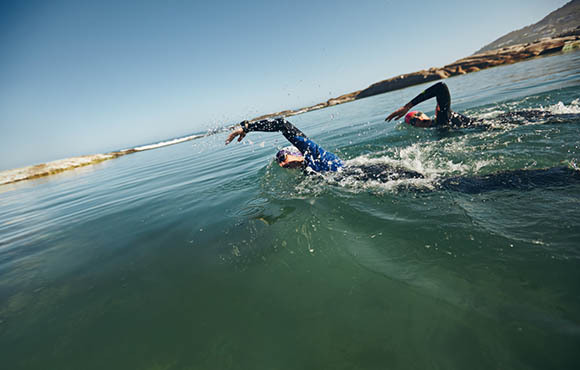 When it comes time to return to open water training, stay close to shore and swim with a partner. You can get a great workout in just thigh-high water where you can easily stop and stand if you need a break. 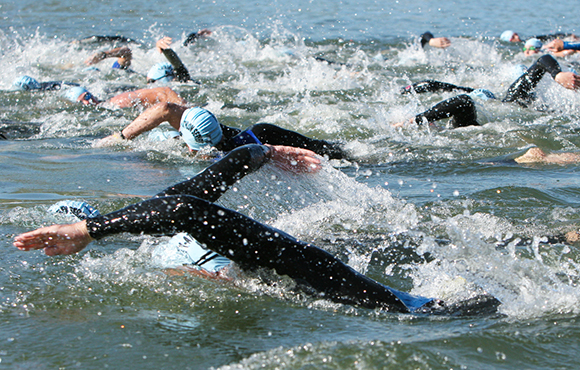 It might help to simply do back-and-forth laps of 20 to 30 strokes so you remain in the same areas of the water. There is no pressure to go far out from shore; you only need to do what you initially feel comfortable with and gradually extend that by 5 to 10 strokes. Give yourself constant reassurance on your efforts and improvements. 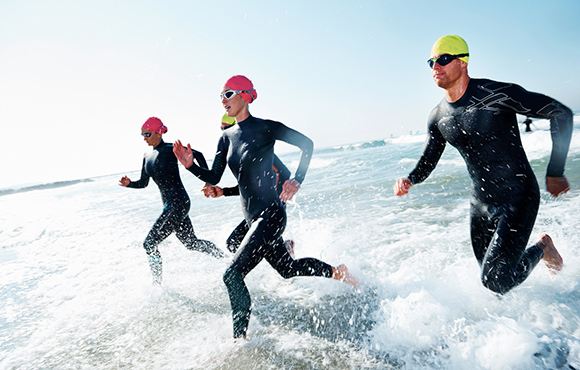 Even while you're focusing on improving, it's smart for all triathletes to have a go-to plan if they need it. If the situation is getting the best of you and you feel panic brimming, the fastest and easiest strategy is to simply roll onto your back and remain buoyant so you can breathe easily with your face to the sky. You may still need to be mindful of waves or swells but simple kicking on your back will allow you to regain your breathing and composure, give you the chance to return to your normal stroke. Also try mixing in breast stroke to keep your head above water and regulate your breathing before you return to your normal stroke. Practice rolling onto your back in a pool as well to get used to the feeling and how to quickly get in or out of the position while still kicking and using your arms for balance. Doing this when you're safe, calm and confident in a pool will make you more confident to use it in the open water. 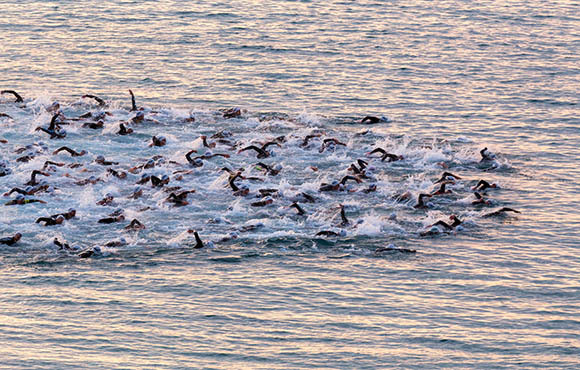 The opening few hundred meters in a triathlon is perhaps unlike any other sporting experience. The close confines of thrashing arms, kicking legs and the need to breath: It's no wonder it is the biggest turn off for most, even die hard triathletes. And further into it, around the turning buoys, can be just as clogged and uncomfortable. The key to not becoming a victim of the situation and instead being able to cope confidently comes down to your mindset and strategy. 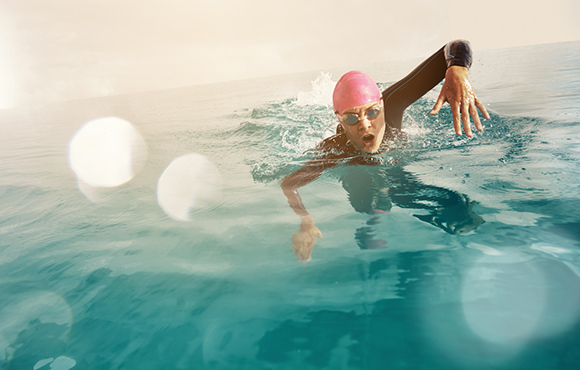 Regardless of whether you're a front, middle or back of the pack type, a strong swimmer or not, you will give yourself the best chance at a successful swim by adopting an assertive approach. Being assertive is about 'owning your space' and being firm in your stroke and kick while maintaining your preferred pace. Keep a good arm extension in front of you to help hold your line—that way you'll know you've got the space to take a full stroke each time. Assertive is not "aggressive" or "arrogant" and being unsportsmanlike is never acceptable. On the other hand, when not being assertive enough you can disrupt your own experience by relinquishing your line or space to anyone who comes near, either by pulling up, slowing down or moving far to the side. Others may be coming up behind you and being passive in your stroke makes you more vulnerable to sudden bumping from behind. The best way to get used to being assertive in a crowd is to practice. Join a group swim squad or find a training buddy. Get used to swimming with others right beside you. Get used to bumping and getting knocked a bit. You'll gain confidence knowing you can handle it and discovering that the extra splashes aren't too bad after all. Have your coach or buddy gently grab your ankle while you're swimming to get used to the sensation and how your assertive, consistent stroke and kick is all you need to shake them loose and keep on your pace. This can be done in a pool or open water with equal effect. 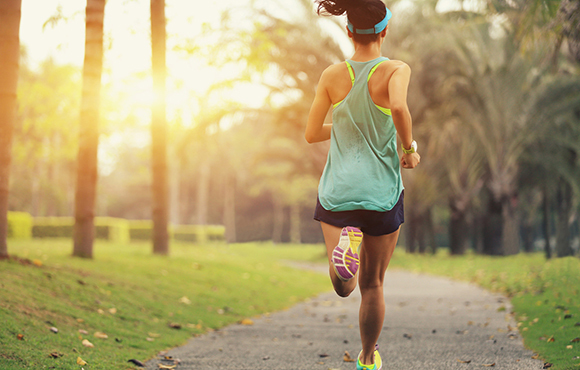 Create a strategy for your starting position and know your optimal pace. If you're racing to place or win and feel you need to be near the front, but still have concerns, start at the left or right edge of the front line, opposite from the first turn. For example, if the first buoy means turning right, then start on the far left of the front line. That way you'll always be on the outside, with less traffic, and will avoid all the other swimmers squeezing down into your lane as everyone approaches the turn buoy. Being comfortable and able to race your own pace is worth being the extra 10 to 15 meters on the outside. Remember: Races aren't won in the swim and definitely not in the first 300 meters. If you're not there to race for place, err on the side of caution. Start to the side or back, start slower and most importantly start at a comfortable pace. Otherwise you risk going out too hard and quickly, and losing your breath. Think of the first 200 to 500 meters as a warm-up if you need to and know that you can pick up the pace and get into rhythm after the initial frenzy is over. 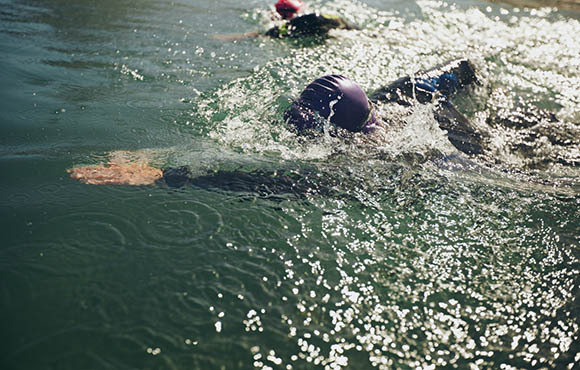 You'll be delighted by how many you'll pass later in the swim as they fade from starting too fast. The cozy confines of your local pool, with its walls, ropes and lines at the bottom, make it easy to focus on what matters—your technique and pacing. But when suddenly faced with an unfamiliar lake or ocean with poor visibility, cold temperatures, rough water and supposed "lurking creatures" your focus is often drawn away from what matters and moves to creating drama and becoming unnerved by the unknown. Whether irrational or real, you have a duty to yourself to learn how to remain steadfast and not relinquish any clout to the unknown and instead remain focused on what matters. Safety is always the No. 1 priority and if you live in areas with sharks, gators or other confirmed dangers then never let your ego make you do something you shouldn't. Find the best and safest alternatives to the convenient ones. But for most of us the drama is in our heads, not the water. Fish, turtles and other water life are going to be more afraid of you (and the dozens of other triathletes) and will head in the opposite direction. Underwater plants and mud may be gross but they will be a non-factor when you start swimming. So quickly get in and get moving and you'll have less time to create worry in your mind. Visibility in lakes and oceans is usually poor to non-existent. And even if it was good, there won't be the friendly black line on the bottom. Yet this can all be overcome with a little practice and focus. There are three things you should look for: the target on the horizon (usually a buoy), a landmark on land and swimmers in front of you. Getting used to poor visibility can be done in a pool too. Simply close your eyes when your face is in the water and open them when you turn to breathe. It will feel odd at first but will quickly become a rhythm you can be comfortable with. Once you have some comfort with that, start to work on 'sighting': As you return your face to the water, glance up at the end of the pool. You only need to keep your eyes above the water line. Practice this every two to four strokes. Bonus: This will help strengthen your neck muscles which will help you be able to do this over a longer distance. In open water, look for a landmark building, tower or tree to keep as your target and gauge for your line. 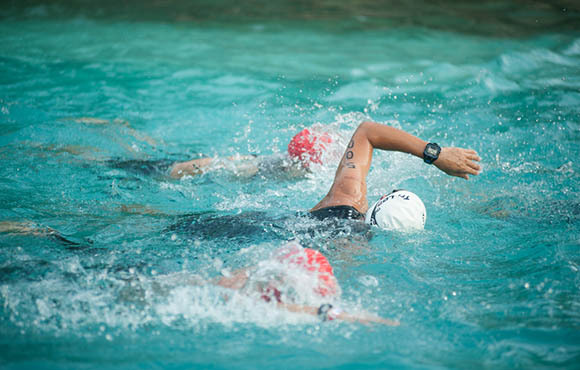 During a race or training swim with others, follow the bubbles of the kicks in front of you but still use sighting with your landmark to ensure you are not taken off course by someone else. If your concern has to do with not being able to see the bottom, just trust the fact that it's there and you don't need the bottom when you swim. You can always tread water or turn on your back if you need a break. 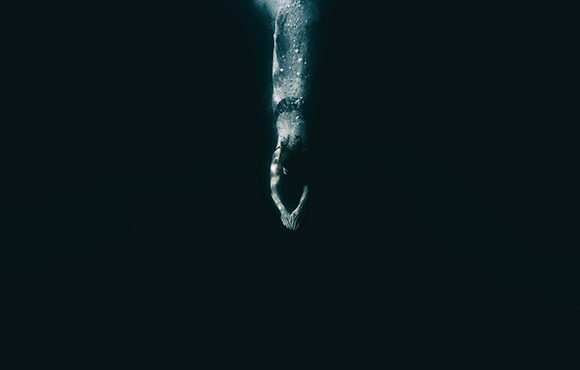 There can be a very real physiological reaction to cold water swimming, even with a wetsuit. Your body will naturally tense up and your breathing can shorten and quicken. Overcome this by doing a proper warm up, splash water on your face or submerse yourself in it for a few seconds before swimming. Even taking cool-to-cold showers the few days beforehand can help you mentally and physically adapt more quickly. 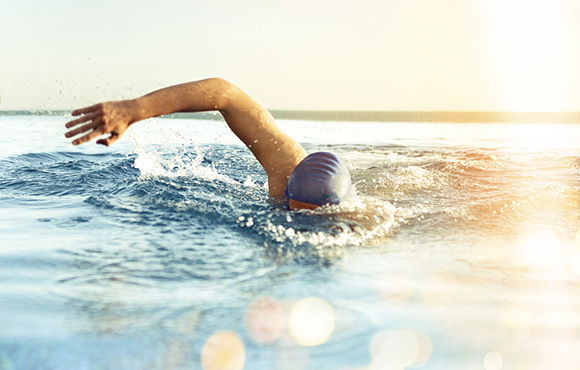 While swimming, focus on taking slow, methodical breaths, this will override any tendency to breathe short and will help to relax all your muscles to swiftly get into your full pace and normal effort. 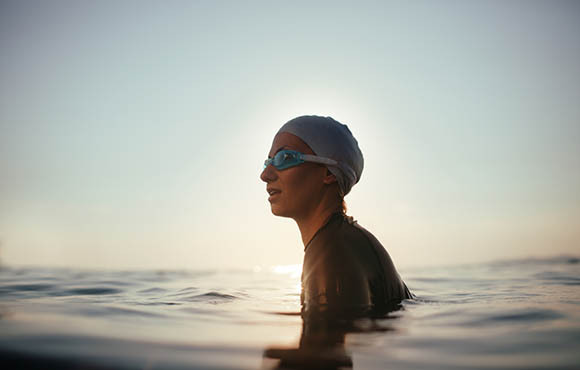 You won't be cold forever so the sooner you get into the swim, the sooner you'll be able to adapt to the temperature and turn your thoughts to great technique. As with everything, the more you practice, the better you'll get and the more confidence you'll have to just get out there and perform at your best.